reduce a complicated project into smaller components. establish a timeline with deadlines for each part of the project. provide a sequence for delivering each part of the project. be the baseline to measure progress against. 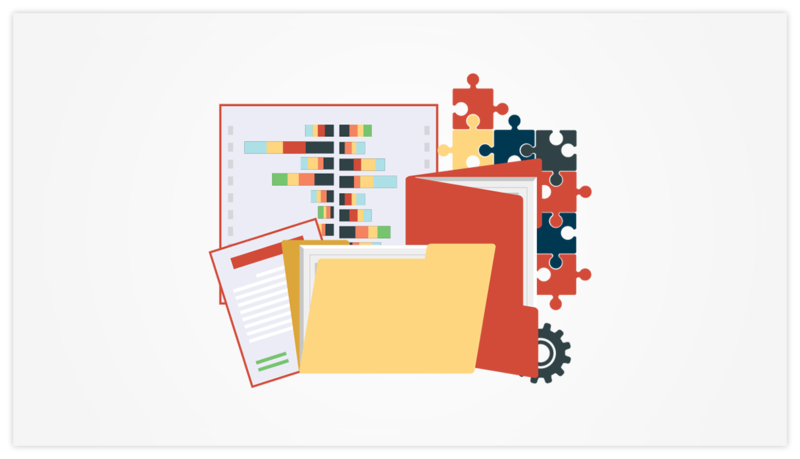 become the default reference document for all stakeholders. The project planning method need not be process-centric and document heavy. If you have authorization to proceed and budget, the next step is to plan the project’s course. Here is a practical approach for creating a visual project management plan. Project managers need to understand the goals of the project they are executing. Goals are determined in the initial phase by management and stakeholders. They are typically created as high-level business statements that give a PM perspective for what the project is trying to achieve. Goals are un-measurable business statements that also define a benefit, for example: The goal of this project is to increase the product satisfaction level for all of our existing customers. Your project may be one of many others that are collectively working towards achieving this bigger business goal, however, it is important to understand them because the goal will be a reference to the objective of your project. Objectives are specific to Project Managers. They are measurable and dead-lined statements that capture what the project is trying to achieve. For example: The objective of this project is improving our average tech-support response time to under 1 hour, for all existing customers, by implementing a new ticketing system by September 30th. The objective does not describe your deliverables but it will help you define them, which is the next step. Identify your major strategic deliverable that achieves the objective, in our case it is: implementing a new ticketing system. Begin to decompose this deliverable into smaller more manageable tasks and further into subordinate tasks depending on complexity. Most often this is done on a list, but it can be more effective if you prepare something easier to visualize, such as putting your list into a table view or creating a work breakdown chart. The tasks you identify will be used to create a visual project plan. Starting with the kick-off date, begin adding dates for each task based on the estimated task duration. Once you have completed the task dates, start adding dates for the sub-tasks. You can use Office Timeline as a planning tool to do this. The chart you create will not be the final project plan, rather it will be the initial plan that you begin reviewing with stakeholders and your team. Through that review process you will update your plan’s dates and dependencies based on resources, commitments and other variables. The end result will be a visual project plan that has been well communicated. 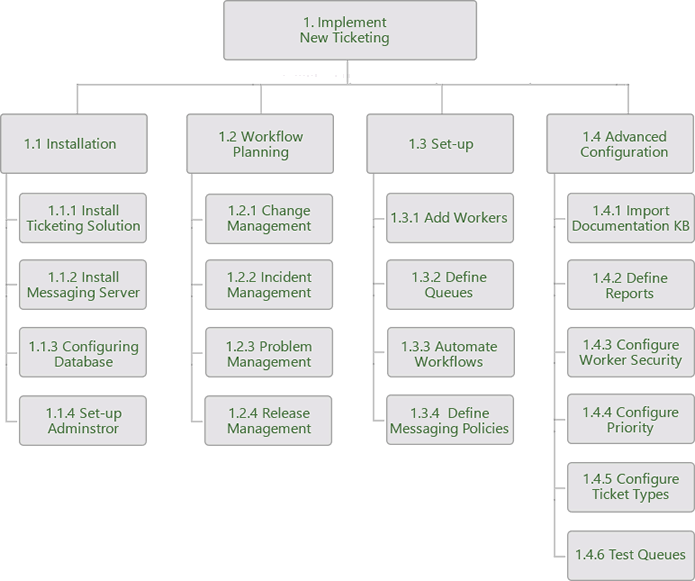 Below is an example of our project plan for implementing a new ticketing system by September 30th. It will be important to get the sequence of your tasks in the right order. 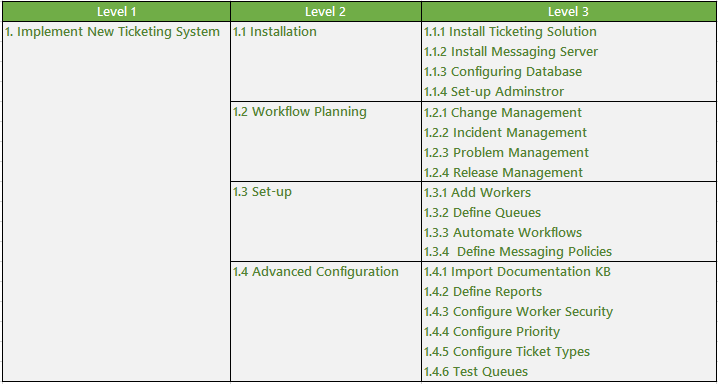 In the above example we can do the Workflow Planning Task simultaneously with the Installation Task, but we cannot start the Set-up Task until the Installation has been complete. The easiest way to do this and to see dependencies is to visualize them by creating a simple schedule in Excel or PowerPoint as shown in the example above. Once you have your project plan as a visual, communicate it regularly with your team, and make adjustments. Using your visual project plan, build a regular communication process to provide clients and executives progress reports. Depending on the size and complexity, Project Managers may need to create subsidiary plans to support large projects. Communication Plan - Large projects may require a communication plan so the right information is messaged to the appropriate parties at the right moment. The plan would identify all parties who need to know about the project, and what it is each party needs/wants to know. The plan should also determine the best way and best format to communicate with each party. Scope Management Plan - Complex projects may require a Scope Management Plan that provides guidelines on how to identify what is required to complete the project, and what work should not be included as part of the project. The plan should define how project scope will be identified, validated, documented and handled by Project Managers. The plan should also define how to manage changes (change control) to the project’s scope. Schedule Management Plan - Project teams that are anticipating schedule changes should create a schedule management plan that defines how they will be handled. The schedule management plan should define the control process for the project including changes that are introduced through the change management processes or through time limits. 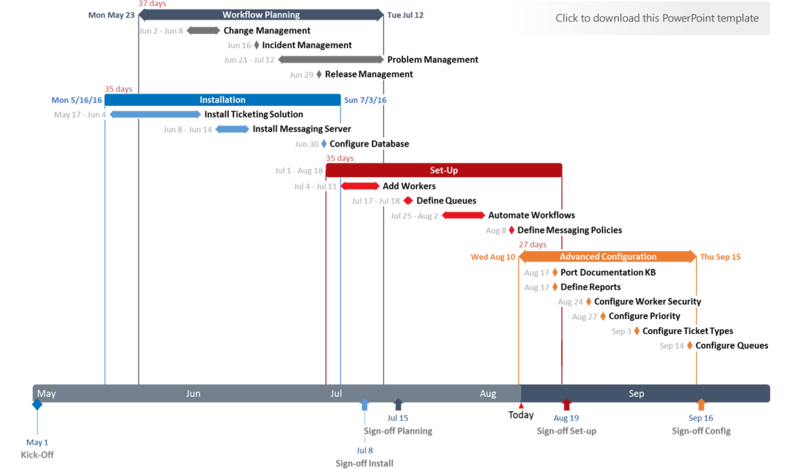 Office Timeline is an award winning Project Planner for PowerPoint.